For a lot of the people who joined Al Sharpton's Reclaim the Dream rally and march, it was their first opportunity to experience something close to what people saw and felt when they marched in Selma, Ala., or sat in at Greensboro, N.C.
As the marchers made their way from Washington's Paul Laurence Dunbar High School — the first public high school for African Americans in the country — to the National Mall and the future site of the Martin Luther King, Jr. National Memorial, more and more supporters for conservative Fox News TV host Glenn Beck and backers of the conservative Tea Party watched from the sidewalks. Some wore T-shirts reading "Restoring Honor," the name of the Glenn Beck event that took place the same day. The scene under the white-hot sun was surreal as the Glenn Beck and Tea Party supporters made two-fingered peace signs at the Reclaim the Dream marchers and sometimes offered a high-fisted show of purported support or even applauded. Organizers of Beck's event had advised participants not to start anything. Sharpton, president of the National Action Network and organizer of Reclaim the Dream, had done the same. But still, the feeling that oozed psychically from the conservative onlookers was anything but friendly. Many held up video cameras or shot pictures. Others looked on silently and smile-free. Gwen Wardell-O'Neal of Hamilton, N.J., said she was happy that people who don't agree with other Americans can have such beliefs but not act on them. Regarding Saturday, Wardell-O'Neal, 58, said, "Even though there wasn't physical violence, there was a certain look." Harry Johnson said he was happy the potential clash did not happen. Johnson is heading up the fundraising effort to open the King memorial on the Mall in the fall of 2011. 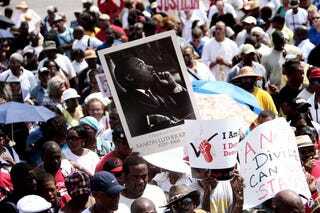 King was a convener of the march and delivered his seminal "I Have a Dream" speech there. "Dr. King really stood for everybody," said Johnson, whose buildthedream.org fundraising effort is now $13 million from its $120 million goal. King was a member of Alpha Phi Alpha, as is Johnson. The fraternity launched the movement to build the memorial on a four-acre site. "Dr. King was a person who fought a war without any weapons, and his weapon was non-violence," Johnson said. The Glenn Beck and Tea Party supporters would not have felt uncomfortable at the inclusive Reclaim the Dream event, said Caroline Brewer, spokeswoman for the Brady Campaign to Prevent Gun Violence. "It wasn't a countermarch, but I think that the people who spoke showed up because they wanted America to know," she said. Said Martin Luther King III in a speech at the site of his father's memorial: "We have to learn to agree without being disagreeable." Those who had been at the original 1963 March on Washington talked about traveling in the backs of public buses to get to Washington from South Carolina, Mississippi and Georgia, and bringing along fried chicken legs and wings in brown paper bags. Back then, the streets of downtown Washington were sardine-packed with people heading to the march. The atmosphere Saturday didn't come close, they said. Sammie Whiting-Ellis was living in Chicago back in 1963 and had flown in to Washington. "The mood was electric," said Whiting-Ellis, 64, who now lives in Washington. "Every generation was there." Those who represent the generations after Whiting-Ellis might not have felt a similar electricity, but the march was thought-provoking, they said. Ernest Robinson is the type of person some of the speakers at the march were targeting, with their admonitions that young African-American men pull up their pants and inject some ambition into their lives. Robinson has already done that. At 27 Robinson, of Richmond, is a husband and the father of 13-month-old Kalia. He's a senior criminal-justice major at Virginia Union University and a member of the Marine reserves. He wore a suit on Saturday. He said he appreciated many of the messages from the march, but he also, when pressed, offered some advice for his predecessors. "How much integrity would you have to go up to a person and tell them to their face to pull their pants up?" Robinson asked. "It's easy to say something from behind a microphone," he said. "It starts from here." Melanie Eversley is a Maryland-based journalist who has covered politics and civil rights for almost 20 years.